One of the most influential indivuals to spread the teachings of yoga to the West would unquestionably be B.K.S. Iyengar, a prize student of Krisnamacharya and the founder of Iyengar Yoga. Although yogic texts have been in existence for over 5000 years in the East, it is only in the last century, beginning with Swami Vivekanda’s address on yoga at the World’s Parliament of Religions in 1893, that the ancient teachings have made it to our side of the world. B.K.S. Iyengar has made yoga extremely available worldwide through his teachings and his many widely-distributed books. He made the prized yoga texts readily availble for all of his students to broaden the scope of knowledge concerning yoga. B.K.S. Iyengar was born in 1918 in Belur, a village in the state of Karnataka, India. Born weak with influenza, he continued to face health struggles growing up; he experienced bouts of malaria, typhoid, and tuberculosis. Sixteen years into his life, Iyengar’s health took a turn for the better when his sister married his soon-to-be Guru, Sri T. Krishnamacharya. Krishnamacharya provided Iyengar with some asanas to practice for his health and over time his health improved dramatically. Iyengar remained in Mysore studying with Krishnamacharya, and slowly cultivating his own yoga practice that focused heavily on symmetry and alignment. In 1955, B.K.S. Iyengar Iyengar made his first trip to the United States with the sole purpose of spreading the teachings of yoga. Today, he has been teaching for over 77 years. The first Iyengar studio was opened in Ann Arbor, MI, in 1972. Now at 94 and with his last visit to the US in 2005, marked his final trip and the 58th anniversary of his initial arrival onto US soil with his first Iyengar studio opening in Ann Arbor, MI, in 1972. On October 5th, 2005, 1800 yogis congregated at Royce Hall on UCLA’s campus to hear Mr. Iyengar (or Guruji, as his followers call him) speak. The program opened with a spellbinding performance from two Indian dancers as well as excerpts from a film about B.K.S. Iyengar by Diane Estelle Vicari. Iyengar was recognized for his contributions to the practice of yoga, his insights into the alleviation of depression and mood disorders, his work in aiding those with neurological disease, and his achievements in alleviating chronic pain and health problems in youth. Those awarding Iyengar included the University of California at Riverside, the Neuropsychiatric Institute at UCLA, the Mattel Pediatric Pain Clinic at UCLA, and the Multiple Schlarosis Society. The overwhelming impression that one took away from the event, was Iyengar’s immense ability to incorporate humor and grace with his answers and his unparalleled capacity to assimilate yoga into a western framework and lifestyle. In line with spreading the teachings of yoga, B.K.S. Iyengar’s greatest accomplishments to date include being named by Time Magazine as one of the 100 most influential people in the world (2004), and authoring 14 books, including the well known "Light" series. Light on Life, his latest book, is the fourth in this series and stands as a synthesis of his life. As Iyengar closed his talk at Royce hall, he told the audience that the original meaning of yoga is to live auspiciously and it is his belief that the 21st century is guiding us there. Let Yoga be your guide. It has guided me since 1990 starting out by studying with an Iyengar teacher & one book. My yoga practice has blossomed by spending a massive amount of time with a variety of teachers, gurus, seminars, trainings, self-awareness and my own teachings as well. Know Yoga~Know Peace is my mantra. B.K.S. 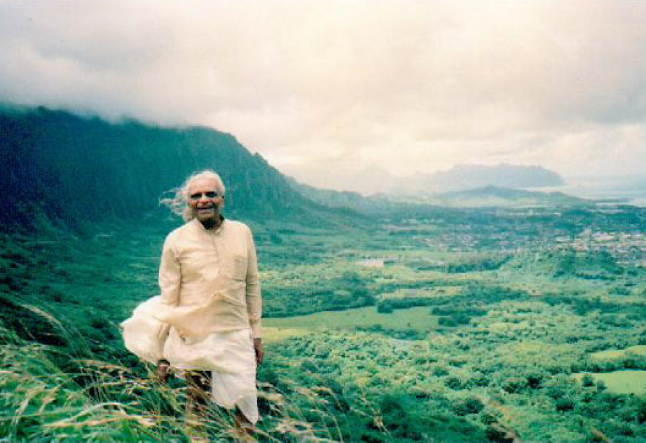 Iyengar died on August 20, 2014 at the age of 95 in a hospital in Pune. His cremation was held at the Vaikunth Auditorium on the same day.